Vano is a very cool tangle pattern from Dutch tangler Hanneke Sieben, and it’s her first on the site. 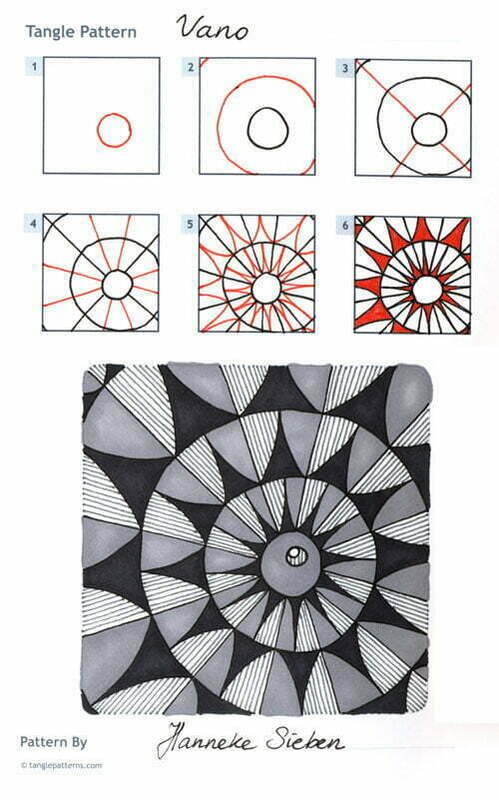 Vano is easy to draw and can fill any shape of section in your Zentangle® tile. The most difficult part of this tangle is drawing the freehand circles (come on, no cheating, this is Zentangle!) of the first two steps. I found that by practicing “air circles” above the section first, and then drawing them in arcs, I did reasonably well. Any irregularities in your circles become disguised when you proceed with the rest of the tangle. I’ve left my example without any embellishments (shocking, I know) but as you’ll see in Hanneke’s illustration below it can take various fills and shading very well. Hanneke introduces herself and tells us about the inspiration for her tangle. I’m a 35yo working mom from Eindhoven, The Netherlands. I got into Zentangle when my 9yo daughter got a Zentangle Basics book for her birthday. The whole family got hooked! I also like to knit and made some knitting designs too. Vano was inspired by a red light on the backdoor of a white van in front of me while waiting at the traffic lights. Here Hanneke illustrates the step-by-step instructions for drawing Vano and features it in a monotangle. Hanneke also sent along a very colorful Zentangle-inspired Artist Trading Card (ATC) with Vano filling a section of a Cadent grid. Check out the tag hannekes for more of Hanneke’s tangles on TanglePatterns.com. 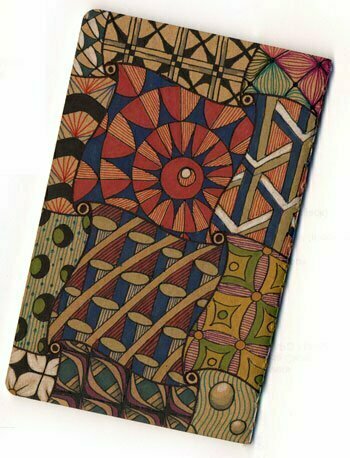 Fantastic ATC card– wonderful subdued colors in rich tones. Can’t wait to practice your VANO ( perfect name!) tangle. Circles make me nervous, though! I am unable to view the step by step illustration for drawing Vano … Only the first 3 steps are visible … The remaining steps are covered by solid black ??? Any suggestions? Thanks in advance!! Make sure your browser is up-do-date or try another one. I recommend Firefox. This is a very nice pattern – like flying geese in the round. Hanneke’s examples are beautiful! Wonderful, bold tangle! And your ATC is gorgeous!! Using Cadent as your string is fabulous! I think I’m going to have to borrow that idea (and try a few other tangles as strings). @Antonine – It DOES look like flying geese in the round! I was drawing a Day of the Dead skull last year and used this in one of the eye sockets; looked awesome!